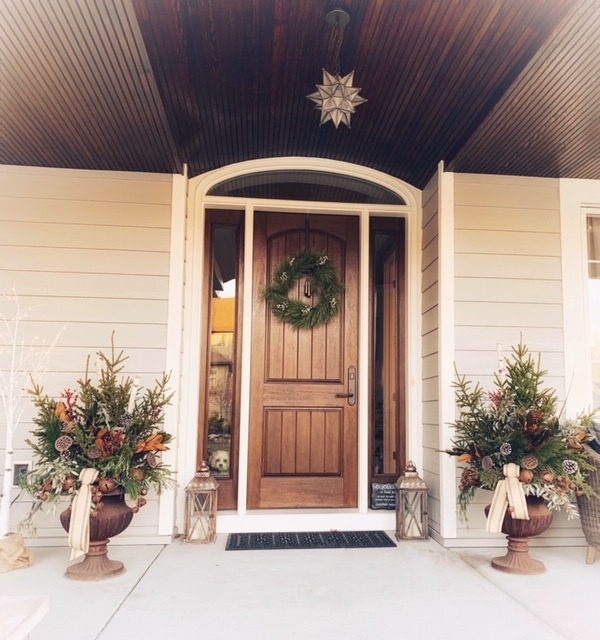 So Thanksgiving is over, fall décor put away and it’s time to decorate for Christmas. I live in Minnesota, and it gets pretty cold after October so I always do my outdoor decorating early so my fingers don’t freeze off while I’m doing it. One of my favorite outdoor decor items is my front pots. My husband takes care of the lights, and I do the spruce pots. I think I got the easier job but I’ll take it. My mom and I usually go to a local nursery and pick up our supplies that we need to buy each year. It’s so fun to walk around and smell the pine and get inspiration. I find my pots typically look the same every year, but sometimes I find some extra goodies to throw in to change it up a little – whether it’s different greens, a different bow or something sparkly. A few weeks back I shared a pic of my front pots on Instagram and I got so many kind comments. I thought I would share my approach if you haven’t done one before. I tried to draw out the steps to make it easier to follow - but please no comments on my lack of artistic skills! Spruce tops can be purchased in bundles, and usually you can get 7-8 in a bundle. If your pots are on the smaller side you can buy one and split between two pots. If your pots are large I recommend one bundle per pot. 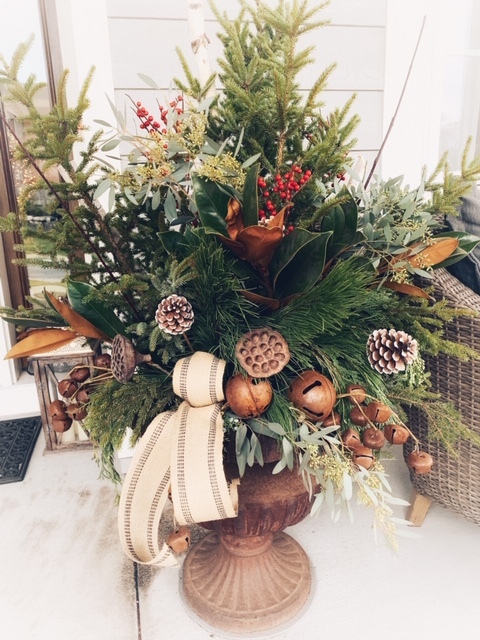 You can also find spruce arrangements that are already put together. You can use these and then add to it to add some personal touches. The drawings below are meant to depict each step. Just scroll through them. I added a different color for each step to make it easier to follow along. Add in faux picks, using it to fill in open spaces. I hope you found this helpful! And as always, thanks for stopping by!